For Prelims: NEC, its functions and composition, about Experiencing North East festival. For Mains: Significance of North Eastern region of the country and efforts by government for the development of the region. Context: The ‘Experiencing North East’ festival is being held. It depicts the uniqueness of North Eastern culture. The festival is being organised by North Eastern Council (NEC), Ministry of Development of North Eastern Region (DoNER) in collaboration with India International Centre. NEC was established under the North Eastern Council Act, 1971 as an apex level body for securing balanced and coordinated development and facilitating coordination with the States. Subsequent to the Amendment of 2002, NEC has been mandated to function as a regional planning body for the North Eastern Area and while formulating a regional plan for this area, shall give priority to the schemes and projects benefiting two or more states provided that in the case of Sikkim, the Council shall formulate specific projects and schemes for that State. The Union Cabinet, in June 2018, approved the proposal of Ministry of Development of North Eastern Region (DoNER) for the nomination of the Union Home Minister as ex-officio Chairman of North Eastern Council (NEC). The Cabinet has also approved that Minister of State (Independent Charge), Ministry of DoNER would serve as Vice Chairman of the Council. Under the new arrangement, Home Minister shall be the Chairman and Minister of DoNER as Vice Chairman, NEC and all the Governors and Chief Ministers of North Eastern States will be Members. For Prelims: Key features of PM- AASA. For Mains: Significance and issues associated with PM- AASA. Context: A recent analysis by agricultural experts has revealed that Pradhan Mantri Annadata Aay Sanrakshan Abhiyan will make no difference to the plight of farmers on the ground this season, and will not improve their chances of getting MSP for their crops. Only Madhya Pradesh has opted for the cash payment component. No other state has readied the IT infrastructure needed to implement it. With regard to the private stockists scheme, guidelines were issued to states last week. It will probably take states and private players about six months. And there may not be any takers in the current season. Giving a major boost to the pro-farmer initiatives of the Government and in keeping with its commitment and dedication for the Annadata, the Union Cabinet approved, in September 2018, a new Umbrella Scheme “Pradhan Mantri Annadata Aay SanraksHan Abhiyan’ (PM-AASHA). The Scheme is aimed at ensuring remunerative prices to the farmers for their produce as announced in the Union Budget for 2018. The selected private agency shall procure the commodity at MSP in the notified markets during the notified period from the registered farmers in accordance with the PPSS Guidelines, whenever the prices in the market fall below the notified MSP and whenever authorised by the state or UT government to enter the market. The maximum service charges up to 15% of the notified MSP will be payable. For Prelims: Meaning of Currency manipulator. For Mains: Concerns, implications, challenges and issues associated with currency manipulation. For Prelims and Mains: Features and significance of Krishi Kumbh. Context: The government of Uttar Pradesh in association with the Government of India is organizing a mega Agriculture Expo called “Krishi Kumbh-2018”. For Prelims and Mains: Key features and technological implications of the feat. Context: Train 18, India’s first engine-less train for inter-city travel is set to hit the tracks very soon. Context: India railways is planning to link New Delhi and Ladakh by means of a railway line that will run along the India-China Border. Significance: The proposed Bilaspur-Manali-Leh Line will be the world’s highest at 5,360 metres above mean sea level which is comparable to China’s Quinghai-Tibet Railway Line at 2,000 metres. Context: UN names Human Rights Prize winners for 2018. Asma Jahangir, Rebeca Gyumi, Joenia Wapichana and Front Line Defenders are honoured by the UN for promoting human rights. The United Nations Prize in the Field of Human Rights is an honorary award given for outstanding achievement in human rights. Prize was established by the UN General Assembly in 1966 and was awarded for the first time on December 10, 1968, on the twentieth anniversary of the Universal Declaration of Human Rights. The 2018 award ceremony will take place on December 10 on World Human Rights Day in New York. The nationwide sanitation movement of Swachh Bharat Abhiyan has been successful in not just eradicating open defecation from numerous towns and villages across India, but is also creating a national consciousnessin terms of sanitation and cleanliness. But the mere task of building toilets will do India no good, unless a National policy for treating sanitation waste is adopted at the earliest. Untreated sanitary waste has been dumped recklessly in our rivers and lakes for years, resulting in rivers like Ganga and Yamuna facing severe pollution crisis. Treatment capacity is available for only 37 per cent of the 62,000 million litres of sewage generated in urban India daily, thus creating a wide gap between sewage generated and treated. The urban metros in India have a planned sewerage network with underground pipelines, pumping stations and treatment plants. India’s 7,000 smaller urban towns do not have any existing sewerage system since the amount of financial expenditure, skilled operators and electro-mechanical maintenance required is unlikely to be implemented anytime soon. Nearly 62.5 per cent of wastewater in urban India receives partial or no treatment. Bad sanitation is India’s worst-kept secret, but recent data from Uttar Pradesh show that in spite of working in mission mode to expand sanitation, 87% of faecal sludge expelled from toilets in urban areas is untreated. The study in U.P. conducted by the Centre for Science and Environment has now exposed broken links, of faecal sludge and septage being collected from household tanks and simply discharged into drains, open land and wetlands. What Will be the Way the State and Central Governments must follow? The problem of the waste not being contained, collected without manual labour, transported and treated safely is becoming graver. It is now time for a new approach. This has to be decentralised and different from the strategy being used to clean the Ganga, for which the government announced an outlay of ₹20,000 crore in 2015. It is welcome that the CSE study is being followed up with a mapping exercise on the flow of faecal waste streams in individual cities. The results for Varanasi, Allahabad and Aligarh in particular should be revealing, since the collection efficiency for sludge in these cities ranges from just 10% to 30%. A large State such as Uttar Pradesh provides the opportunity to demonstrate commitment to policy. Given the pace at which toilets are being constructed in urban India under the Swachh Bharat Mission, the introduction of policies and programmes in sludge management in timely and will help in the management of faecal sludge in urban India. Viewed against the 2030 goal to achieve clean water and sanitation for all under the UN Sustainable Development Agenda, this depressing statistic shows how much work remains to be done. The National Urban Faecal Sludge and Septage Management (FSSM) Policy is a welcome move on behalf of the Ministry of Urban Development. The policy will lay stress on the setting up of faecal sewage treatment plants in cities and urban local bodies, as well as address the restructuring of sewerage systems in urban India. 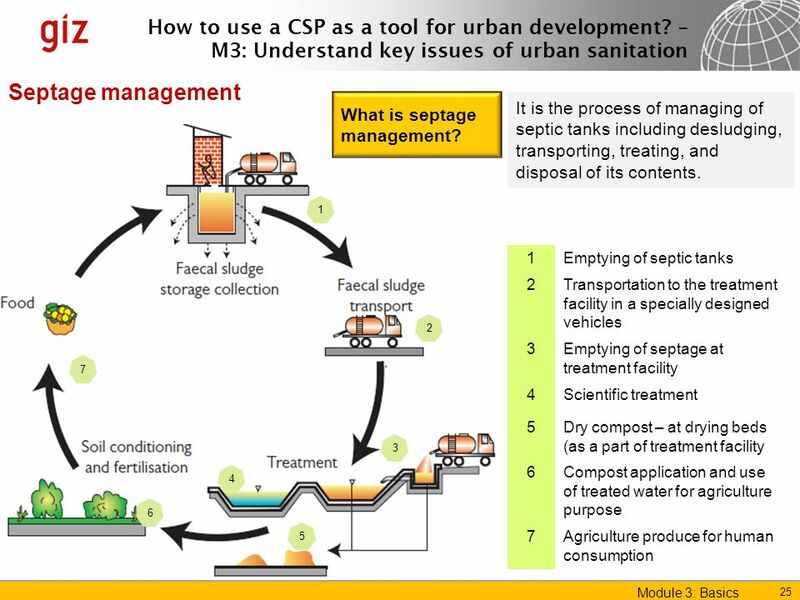 FSSM also takes care of a policy lacuna at the national level to address gaps in urban sanitation and lays down a clear vision and objectives to deal with faecal sludge and septage. All aspects of the business of sanitation need reform if India is to meet Goal Number 6 of the Sustainable Development Goals with egalitarian policies. Decentralised sludge management systems would bring improvement in the environment and reduces the disease burden because of insanitary conditions. Mapping of the flow of faecal waste streams in individual cities is required. Inter-departmental task forces are needed to identify land for building small treatment systems for sludge. Manual scavengers continue to be employed in violation of the law to clean septic tanks in some places and urgent mechanisation is to be done. The business of emptying faecal material using tanker trucks needs to be professionalised and de-stigmatised without the use of manual labour. By implementing the above lines in Letter and Spirit, Success here can transform lives.